Shiseido launches a new product that contains Ultimune Complex that was developed from 20 years of dermatological research. The new Ultimune Power Infusing Concentrate is an essence designed to boost the underlying beauty. Basically, it enhances the skin's immunity. I am very happy to receive a sample size from my subscription at BDJ Box this August. Shiseido is known for creating the holy grail items for skin care and I have been a fan of this brand for years because I really find their products effective. I am not only an enthusiast of Shiseido, I love their products so much that I always recommend them to my fellow nurses and doctors who needs vital skin care to our hectic schedule as well as exposure to a dry and cold working environment. I use Shiseido's foundation, their Ibuki softener which I already posted a review before. Now, I am excited to try this new product. What does the new Shiseido Ultimune Power Infusing Concentrate product entails? It is a concentrate made to enhance the skin's defense against skin aging and is a boosted for the regular skin regimen. This new concentrate is recommended for all ages. As Shiseido's product description, with just one week of daily use the skin is supple. smoother making wrinkles less noticeable and complexion appears with healthy glow. How does the Ultimune Complex works? It helps boost defensive functions that have declined in Langerhans Cells that hold the key to skin's defense. Recommended use: Apply it on morning and night after cleansing and softening the face. If to be used with other serums, apply Ultimune first to enhance the following treatments. I am now going to share my full experience with the sample that I got. 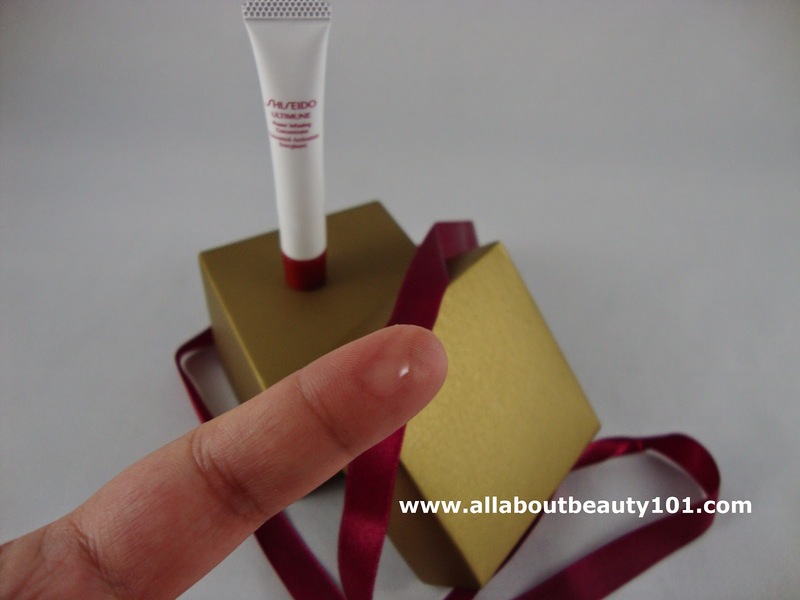 The tube contains a clear liquid form like a serum (as seen on my photo above) that is easy to spread and apply on skin. The scent is light and relaxing. Inhaling the scent is making me feel at ease. 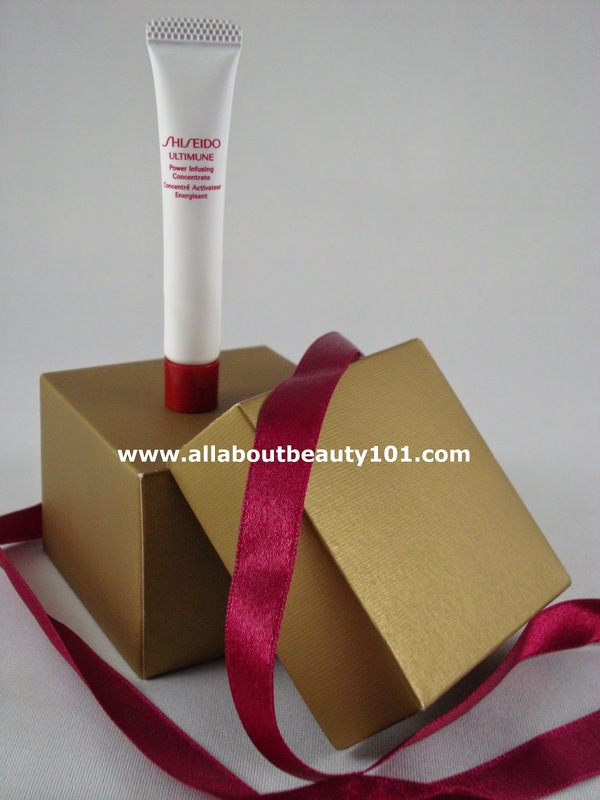 The concentrate is non-greasy which I love most on Shiseido products. After applied on my face, their is an immediate softness and smoothness that can be felt. There is no greasiness encountered even after the few hours that it was absorbed on my skin. There is no sting or irritation experienced, I consider this product mild and gentle. After a few days of use, I noticed that my pores looked smaller and my skin looked brighter. I don't notice the glow as of the moment and the wrinkles is not that much observed since I do not have it yet. I will observe the glow if it will appear if I continued to use the product on for a few more weeks or at least until my supply lasts. Otherwise, I am very contented to see that my skin is brighter, smoother, softer in just days of use. The Ultimune Power Infusing Concentrate looks promising.